Beyond the ditch there is a vast stretch of grassland called Ahuti kanan. Situated in this valley is a holy shrine of the forest Goddess Banadevi or Banadurga. In front of this temple is a self oozing tank of warm water. You can see and hear the bubbling water rise up to the surface from the bottom. It is known as the second Ahuti Kunda. Various paths and terrains run into the deep forest. Forest guards used to guard various parts of this forest as their duty,deployed by the Forest Department of Odisha. Innumerable caves can be found among the vast array of hills and valleys.Long ago,these caves played as the silent witness for various saints, monks, hermits ascetics performing various religious rituals and ceremonies,oblation to attain enlightenment in the path of spirituality. These caves were serving as the hermitages for the sages and monks. Those monks were using these caves for meditation in the deep forest out of reach for the local people. The hills in the northern part of Ahuti valley is known as Kathila hill. 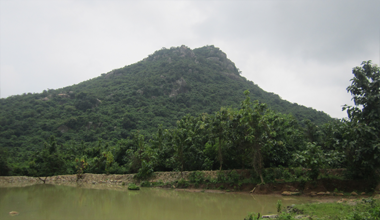 In the east of the valley stands Bhalluk Hill,in west there are several hills such as Budha-Hudia,Upendradiha and Lakshmipada Chatir. In a different part of the valley oblation fire and ceremony used to take place, where the saints poured ghee on the burning fire (oblation ceremony) while chanting mantras from holy scriptures to satisfy the deities. The whole valley was regarded and respected for this purpose, so this valley is named Ahuti Kanan. The whole valley is endowed with an unknown,untold mystical smile of unfathomable mystique.This valley is a mute witness of so many mythological and historical events. The legendary character, Jarasandha, once built a fort in this valley. It is believed that Lord Shri Ram Chandra, Sita and Laxman spent 5 days in this valley during their period of exile. The legendary Pandavas used to reside in this valley and concealed themselves from kouravas. In history,this valley witnessed the fierce and fiery battle between two kings - Narayan Basanta Virat Bhujanga Baliar Singh Deo Mandhata, the King of Kaptipada (Reigned 1521-1564 A.D.) and Nilakanth Bhanja,the King of Mayurbhanja Estate. After losing his citadel,Kainsari fought in the attacking war from the King Nilakantha Bhanja,the Kaptipada King fled away to hide in the Ahuti valley, Panchalingeswar Hills. This place was a dense forest unreachable for any group of soldiers or cavalries. This place was the last bastion for the King Naryana BasantaViart. 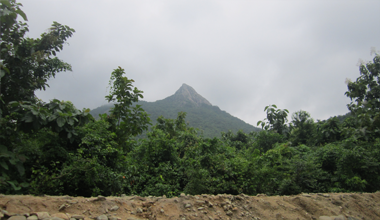 Ultimately the King Nilakantha Bhanja attacked this hill to capture the Kaptipada King.The skilled archers of Naryana Basanta Virat fought up to their last drop of blood and breath.The battle was fierce and violent,lasting for several days, which took the lives of almost all soldiers. Ultimately the King of Mayurbhanja, Nilakantha Bhanja,ended with a huge defeat and lost almost all of his soldiers, cavalries and war heads.